Toledo is best known for his depictions of a reality where the world of animals and humans forms a continuous unity. An extremely versatile artist, Toledo works in varied media, including: painting, print-making, sculpture, ceramics, and photography. Toledo’s new exhibit, Multiples, features forty mixed-media works. Many of these feature laser-cut elements, made from Toledo’s drawings, collaged to vellum or heavy paper and painted in oil or watercolor. Four of these have been made in numbered editions, however Toledo has hand-painted each piece in the edition. 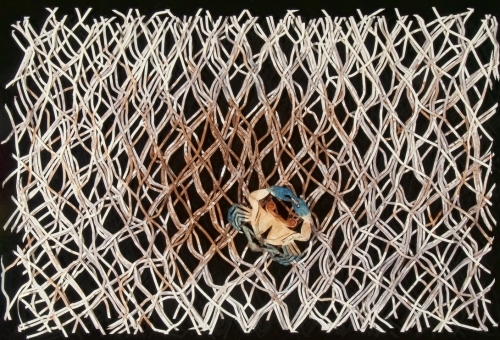 Some works feature a net motif that ties together the composition. These nets have a web-like beauty but, like a spiders web, are capable of entrapping living creatures. Toledo sews sheets of the mineral, mica, into many of these works. Mica was prized by pre-Hispanic cultures for its properties of transparency and reflection. In Toledo’s hands it has an elemental fragility. Perhaps the most powerful piece in the exhibition is a large mica collage, Fish and Swimmer. The piece shows a giant, whale-sized fish swimming with a man. This image of fish and swimmer has a dream-like power that conveys both the relative insignificance of man in the face of nature, and a momentary grace, where man and nature peacefully co-exist. Francisco Toledo has exhibited in many of the world’s important museums, including: Centre Georges Pompidou, Paris, and the Museum of Modern Art, New York. In 1997 his exhibition “La Fragilidad de Alma “ was featured at the Venice Biennal. In 2000 he received retrospectives at Whitechapel Gallery, London, and the Reina Sofia Museum, Madrid. Toledo has devoted much of his life to social activism and the promotion and diffusion of culture in his native state of Oaxaca. Among his many awards areNational Prize for art, Mexico; and The Frederico Sescosse Prize, Unesco.